Whether you’re moving into a home or have been settled for some time, be prepared for projects around the house. Especially if you are new to owning a home, review this list of basic tools every homeowner should have. There are many types of screwdrivers but the two most common ones are the flathead and the Phillips head. Have at least two of each in your toolbox, in large and small sizes. A measuring tape will help you avoid costly mistakes. Measure doorways before trying to move furniture through. When buying new appliances, measure the space first to be certain you can fit the appliance you’re hoping to purchase. Bring the tape measure to the store to double-check measurements. Look for a locking measuring tape and avoid the thin, flimsy ones that fold in on themselves when they’re extended. A cordless drill is one of the most convenient tools every homeowner should have. Install wall anchors for hanging a picture, assemble furniture, or just tighten a loose screw quickly with a drill. Because a cordless drill is so useful, it’s worth investing in a reliable brand that will last. The importance of an adjustable wrench might be overlooked until you need to tighten a nut or a bolt. When stocking your toolbox, also add a set of standard and metric wrenches and a set of Allen wrenches. For both immediate and long-lasting repairs, have a few kinds of glue on hand. Wood glue and Gorilla glue are great, multi-use adhesives. Electrical tape and duct tape are indispensable for quick-fix repair jobs. Hammers come in a range of weights and styles. A standard claw hammer and a rubber mallet will be sufficient for most home improvement projects. Some hammers come with cushioned handles, which is great when high impact work is needed. When you need a stronger grip, rely on the physics of pliers. Groove-joint pliers with a wire cutting edge built into them will add versatility to your repair set. Add standard-sized and needle nose pliers to your collection of tools for around the house. A knife with a retractable blade is useful for opening boxes, sizing carpet, and cutting a variety of items. Get a quality, comfortable utility knife with replaceable blades. 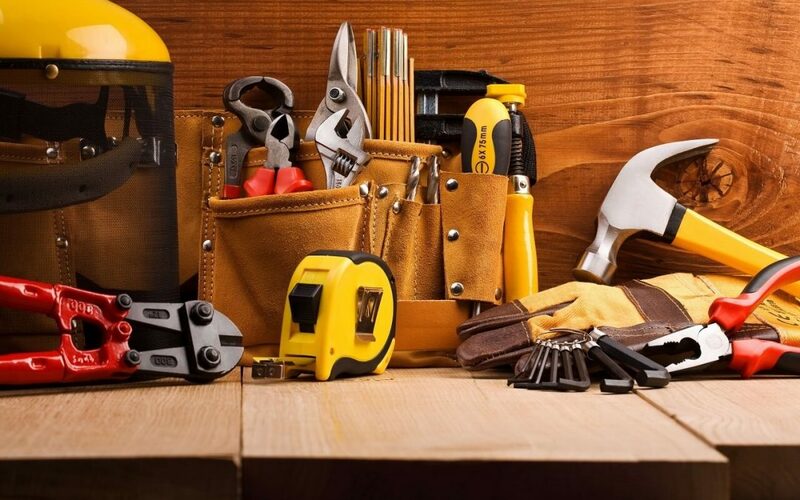 When building your toolkit, also think about storage for these tools every homeowner should have. Find a toolbox for keeping your equipment in one place. Consider one with drawers or pouches for better organization. Buyer’s Edge provides home inspection services to home buyers in Western North Carolina. Contact us to schedule an appointment.